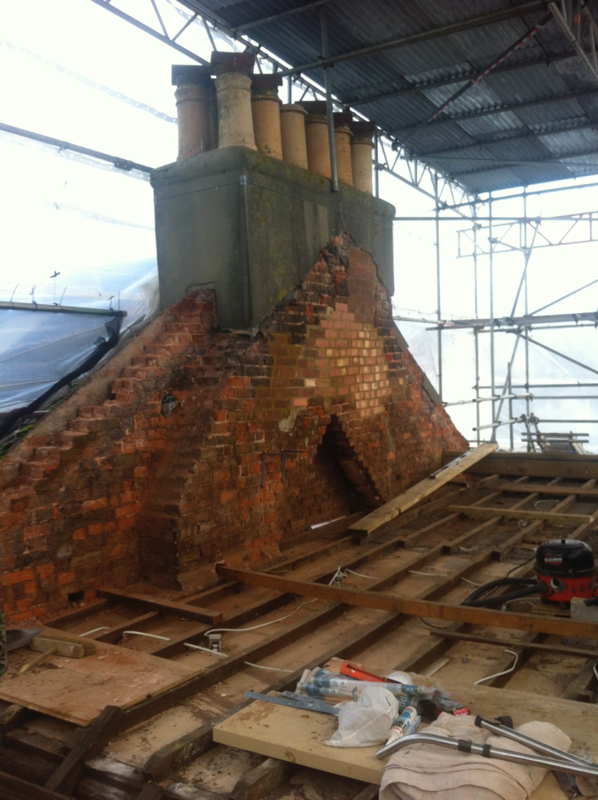 Blog When clients take on some of the building work! Bright Green Homes are always willing to consider jobs where the clients want to get involved and do some of the work themselves. Rachel & Robin Goldberg appointed us to repair their roof and convert the loft into a new master bedroom with ensuite. 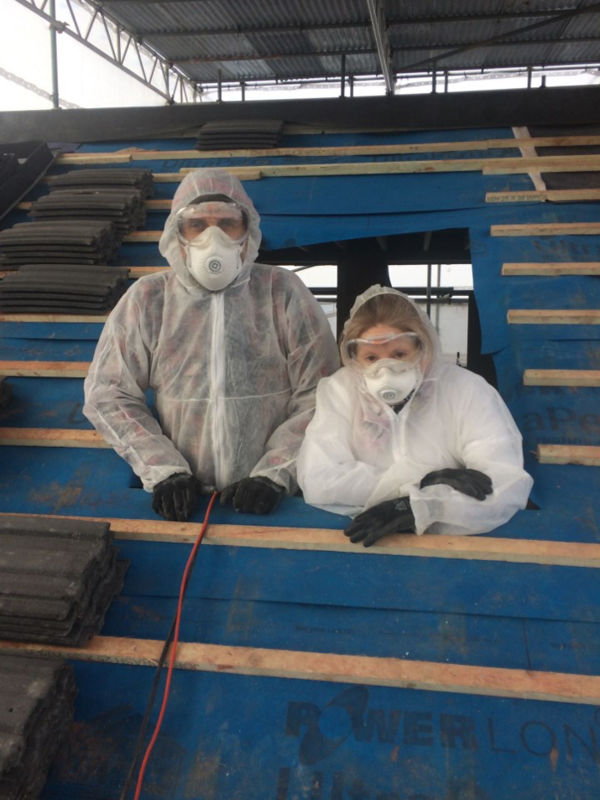 In this guest blog post they share their experience of living onsite and working alongside the BGH team. We would love to buy a plot of land one day for a self-build eco project, but aren’t at that stage yet. At the moment, we live in a Victorian terraced house with its fair share of maintenance issues. Last summer (2016) we reached the point where significant roof repairs couldn’t be put off any longer! 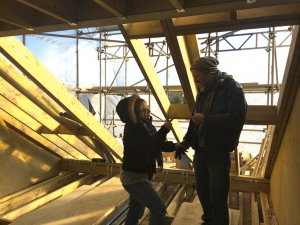 We thought a loft conversion would afford us the opportunity to get hands on and gain experience, with the reassurance that professionals would complete the major structural elements of the project. We expected the contracted work to be done first, then we’d take over and do the finishing and decorating. However, feeling confident, we decided to save money by taking on the insulation and plasterboarding as well. We had no idea of the impact this would have on the schedule of works until we started meeting prospective contractors. Many were unwilling to even consider our project due to logistical complications. But as we near the finish line we know you can have the best of both worlds, you just have to find the right contractor and it helps to answer some questions before you start. Do you want to be treated as the client or one of the team? Naively we thought that, as the client, we would be able to do our bits of work when it suited us! We soon learned that we had to fit in with the schedule of works and that this was subject to change (Ed’s Note: Ha! Newbies! Scheduling is king!). Fortunately, Alex was flexible when our work overran. Likewise we understood when sub-contractors had to work onsite at short notice and/or during ‘antisocial’ hours. So…you don’t stop being one of the team just because you’ve got your client hat on, and vice versa! Do you really know what you’re letting yourself in for? Lots of people warned us about the discomfort of living on a building site. It was dirty and dusty (and very cold when the roof came off in January! ), but what became especially draining was the feeling of chaos, having rooms piled full of ‘stuff’. 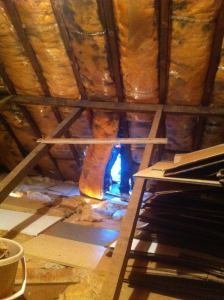 We were literally removing the last items stored in the loft as BGH cut a hole in the pitched roof! We had planned to spend time carefully sorting everything out while the first phase of work got underway. But there was daily decision-making and project admin to be done, as well as our paid work. I only said blow the bloody doors off…. Materials – with DIY, you save on labour but usually pay retail prices. And a bulk delivery would have got in the way onsite. We were very grateful that Alex was prepared to calculate, source and supply the materials as we needed them, passing on some of his trade discount. 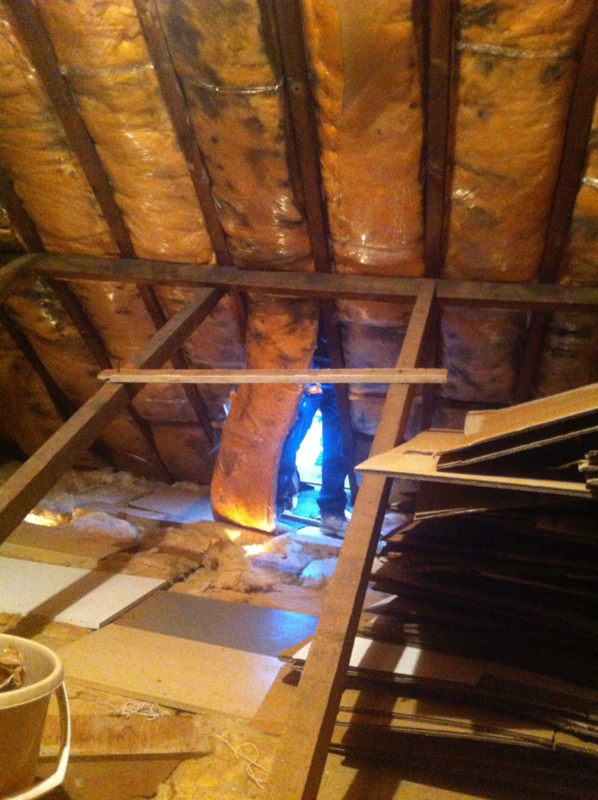 Manpower – we found that plasterboarding a ceiling is a three-person job; those sheets are heavy! We needed two people to hold them up while a third person fixed them in place. We were very lucky that a friend was willing to help just when we needed her. Man-days – most of the skills we learnt weren’t that hard to pick up, but jobs can take an unbelievably long time if you haven’t done them before. In our case, the shower enclosure was quite challenging but the next time will be a lot easier. BGH use the ‘Builder Trend’ app to keep all the project information in one place. But the system doesn’t reduce the admin, it just manages it! We also decided to take on the contract administrator role ourselves (dealing with change orders, valuations and invoices), which was an added pressure on top of the physical work. Keeping tabs on all the paperwork and finances is time-consuming, but essential to keep the project moving forward. What do you stand to gain from appointing a main contractor but taking on some of the work? 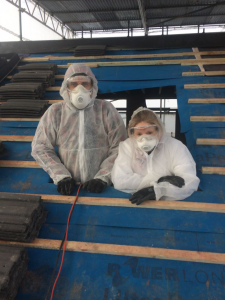 We honed existing DIY skills and learned a lot of new ones including how to install three different types of insulation (using ‘dot and dab’ was fun!) 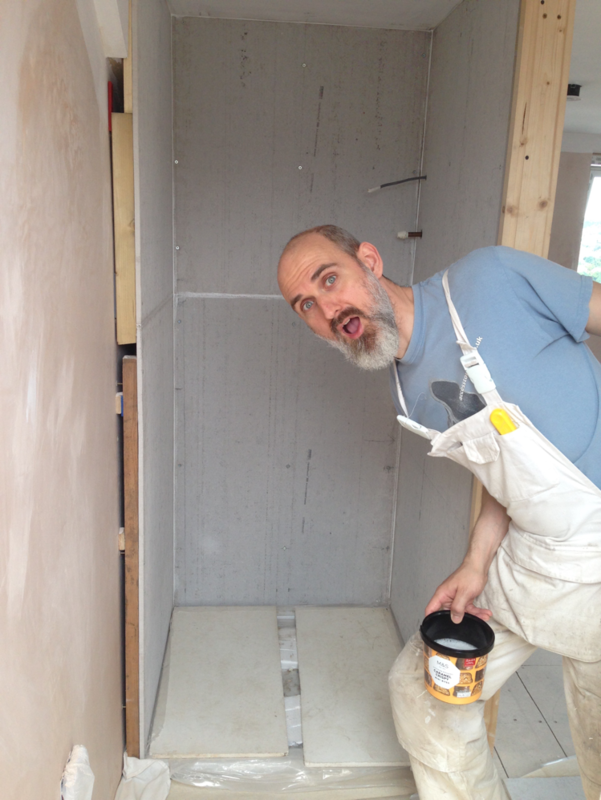 and build out a shower enclosure using cement backer board, as well as trying our hand at tiling and grouting for the first time. The physical work was tiring but it was hugely satisfying to take a step back and see how the rooms were taking shape as a result of our efforts. We feel we know the top floor of our house inside out, in terms of how it evolved from steel beams and timber studwork to the spaces that were eventually plastered. An unexpected benefit was losing a bit of weight and toning some muscles! We had a finite budget and doing some of the work ourselves saved on labour costs, which meant we could afford higher spec fixtures and fittings. We had support when things didn’t go to plan. Alex was extremely sympathetic when we suffered bereavement in the middle of the build. He was very flexible, putting things on hold and re-negotiating with subcontractors. In an existing property, walls aren’t straight and corners aren’t right angles (Ed’s Note: They never are!). Working on the same site meant we understood what the BGH team were up against. Lastly, we have a much greater appreciation of construction, which will stand us in good stead for more ambitious projects in the future. Hopefully! For now though, we can enjoy the amazing view from our new top floor. (Editors note: It’s really one of the best views of Brighton I’ve ever seen!! It’s great working with enthusiastic and engaged clients – but we also needed to build in time in our days to discuss things that might normally take 5 mins, but could sometimes also involve tea & biscuits… just be warned – there is a lot to learn on a site – and all decisions have knock on effects). Maximum of the talents we learnt wasn’t that difficult to choose up, however, jobs can take an unbelievably long time in case you haven’t completed them earlier than. Hi, thanks – glad you enjoyed the article. Very nice article, I found it very useful .Even I have this wonderful website, they are loft specialists .